Ta da! My first home-sewn top is made from the 'Sorbetto' tank top pattern from Colette Patterns. It's available as a free download from their website, and I thought that the promises of "quick to make" and "no closures to sew" sounded ideal for a novice dressmaker like myself. Look at how pleased I am with myself. The fabric is from a pair of polycotton curtains I got from the jumble sale for £2. Metres of fabric, brilliant value, because you don't want to waste really nice fabric when you're just starting out and liable to make a catalogue of errors. Now on to the pattern. I found a couple of things less than ideal for a beginner. Firstly, cutting out the pattern is really, really difficult because it's a multi-size pattern with lines diverging and intersecting all over the place. It's hard at times to work out which line you should be following! Secondly, the recommended width of bias binding to use is 1/2" bias tape, with only a 1/4" seam allowance around the neckline and armholes (it's 5/8" elsewhere). This proved far too fiddly, with such narrow margins for sewing and folding over, especially as my fabric was fraying quite a bit. I had to unpick the bias tape THREE times. Gah. In the end I bought 1" tape, which was too big actually, but hey, it's on finally! Other than that, the pattern seems true to size, and the instructions are really good. I'm impressed overall with the pattern and I'll definitely be returning to have a look at the rest of the Colette patterns when I've improved my sewing skills a little. As for my finished blouse - well, it's amateurish at best. I had to unpick my stay-stitching as it wasn't covered by the bias and then my neckline ended up being a bit stretched out. I think my hem was a bit wonky too. The bias I bought off Ebay was really bad as well. I hadn't realised there were lots of different types, and mine was too stiff and scratchy. I've since found that Hollies Haberdashery do the most wonderful soft and gorgeous bias, so I will be purchasing from them in future. It's not a top to wear outside the house I feel, so I thought I'd turn it into a sleep set and make a pair of matching shorts. I had a pattern from an issue of craft magazine Mollie Makes and whipped up a pair of shorts. I was really pleased, I did a good job! The only issue? I can't get them past my knees. they are TEENY shorts. Supposedly a size medium, UK 10 to 12. More like a 6 to 8. Teeny tiny shorts. More like hot pants? I have plenty more of that fabric though, and I am sure I have another shorts pattern somewhere that might be a bit more accurately sized (nope, I am not blaming myself here - I cut it out REALLY accurately and I printed it 'actual size'). This coming week I am in not in work, hurrah, and so I will hopefully have a bit more time for sewing. I could have an entire pink polkadot wardrobe by this time next week! I definitely had the giggles when I realised how small they were!! I've learnt a lot anyway, so it's not a waste. All good fun!! Well done!!! You did a great job! And the main thing is that you learnt some sewing lessons that will help for the next project. Also it takes time to learn to look past your own mistakes and see the accomplishments. Plus the pictures are super cute! Absolutely, the main thing is the learning. I've learnt to check my sizing!! And to give myself more generous seam allowances regardless of what the pattern says. Onwards and upwards!! Great job! Even thought it might not have come out perfectly, it's still a great start, and a prefect little pajama top. That's so funny about the shorts, though! Hopefully pair number 2 works a little bit better. Buying some curtains was such a smart idea, I'll have to try that. Now that I've kind of figured out how to use my machine, I've been wanting to find a simple project to try. That seems like a great way to keep costs down. I adore those tiny shorts...too bad they don't fit. You did brilliantly for your first time around and I love the fabric you chose. You have far more patience than I. They are quite cute aren't they?! I'm wondering if I can fit a side zip and turn them into hot pants?! I think you did great here and could easily see that top being wearable outside of the house, if one was so inclined. It's cute, fun and super summery. That's an amazing first make! 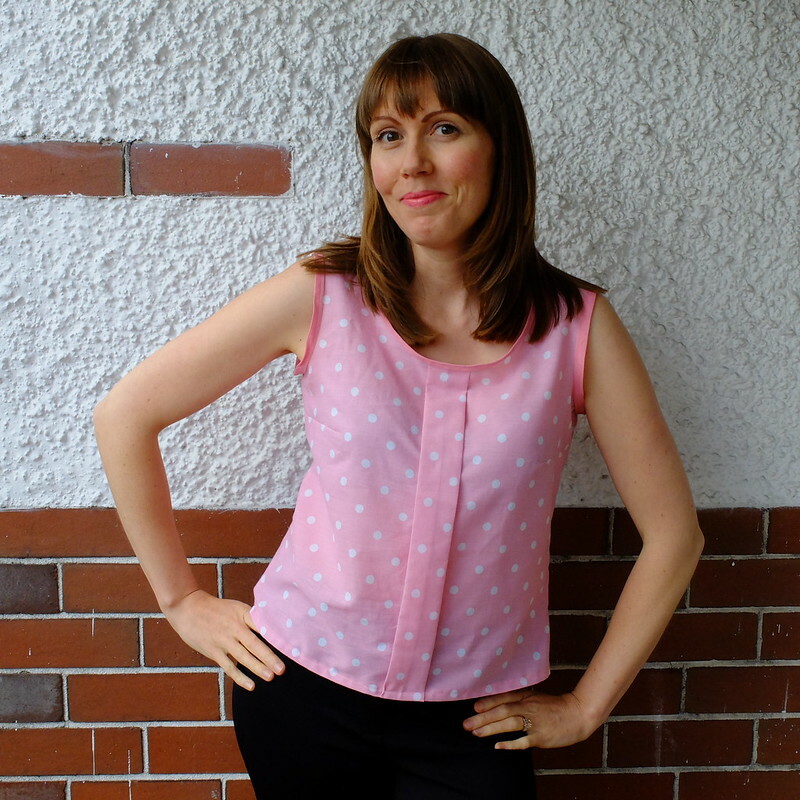 Give the Akita top from Seamwork a try. When I made mine, I thought it would be a great pattern for beginners. Oo that's a nice pattern, I just looked it up! I may well add that to the 'to sew' list, thank you. Well done! I love that you are sharing your learning journey with us. 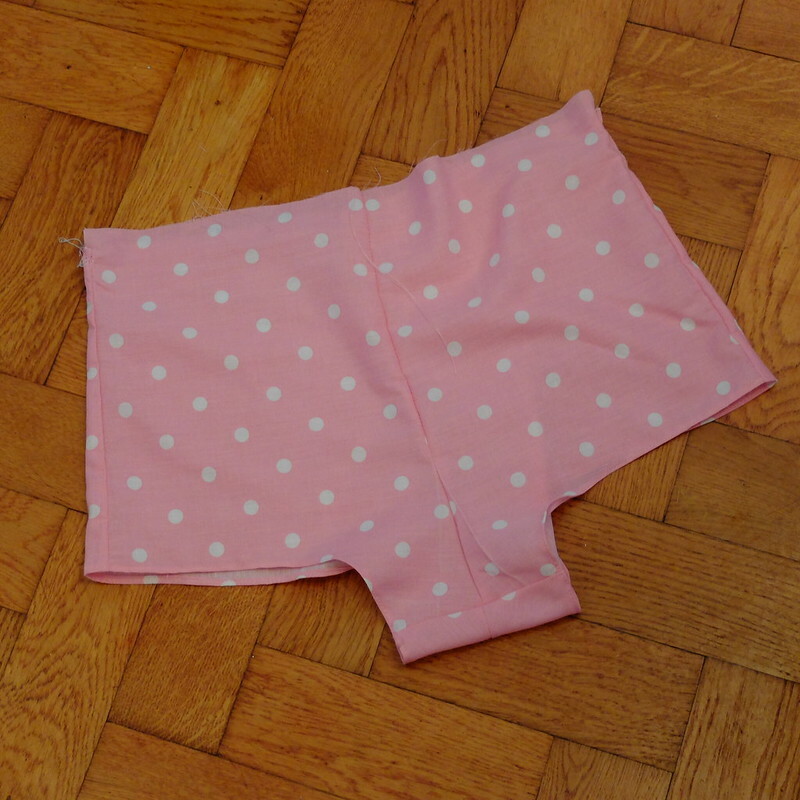 A big bonus of using curtains is that you can just sew up another pair of shorts, and then some more stuff! It's always nice to have spare fabric! A journey shared is a journey better fared?! Thank you! I'm so glad you're sewing! :) Is there any chance the shorts were supposed to be made with a stretchy fabric (like a knit, or stretch woven)? Alas no, cotton or silk was the suggestion with no stretch! I'm impressed that you made something! Stick with it, it will take time. And you have a top to wear in bed, that's great. That top looks fantastic, great find with the fabric, too! At least you didn't waste £££s when the teeny shorts didn't work out. You are so observant, yes I had a hair cut! Hooray! You've done so brilliantly well, I'm so pleased for you and the top looks really good. Right, firstly, my advice is always try and buy trims in 100% cotton if you can, unless, of course you go for satin or such like. Polyester ones are generally awful which I've found out for myself. Vintage trimmings generally don't have polyester in them, so grab any you can at markets, fairs and charity shops. I have a massive stash and will always try and use something in there rather than buy new. Thank you so much - I've just found a few bits in books about pattern grading so will give it a go at some point. Might leave the shorts for a while and rebuild my confidence on other things!! That top is so cute! Great job! I really think it's fabulous! Its not the easiest thing to start with and so you have done a fabulous job, I hate bias taping edges as it can be super fiddly though when it is done it does look great! I applaud you. What a patience. And what a result. Actually I don't see why you couldn't wear this cute top outdoors. Why not? Am I being too Dutch here? My mother taught me how to sew. But I find it takes far too much time. Do you know the blog of Suzanne? A Colourful Canvas. She is a great seamstress and shares lots of tips. Fantastic job! The top came out really well and that is great that you have enough fabric to make a matching pair of shorts. Sorry the first pair came out so small.